I live in a part of the World where we rarely have very hot Summer temperatures... it is often referred to as a Mediterranean climate... the Winters are very mild and the Summers are quite moderate and comfortable. We are on a peninsula and surrounded by sea water on 3 sides so that is a large factor in the weather. But sometimes, just sometimes, we do have some sizzling hot and steamy days. Not enough of them for my liking, but when we have them I do enjoy them. And I make sure to take extra precautions for staying safe when out in the sunshine. I am always a bit envious when I see some of you posting pictures of your long and sweaty runs in the California desert, or along the Chicago lakeshore... hot and dry or hot and humid...yes, I will take either. Of course we all know that we need more water when the temperatures get warmer. So, how do you make sure to stay hydrated? I carry a water bottle with me when I go out at any time of the year. A bottle with a handle is easier to pack along. I have several favorites in my cupboard... metal, glass and also BPA-free plastic. And I do make sure to clean them between uses. I just tossed out two favorite metal bottles because they were getting a hard-water build up in them that I could not remove. My city has a few cold water stations situated in some popular areas where you can safely refill your bottle with clean purified cold water. Great for people and for pets. And if you are finding that you sweat a lot, do make sure to replace some of the minerals your body is losing buy using some kind of electrolyte powder or drink. I like nuun, and have become an ambassador so I can purchase it at a discount. 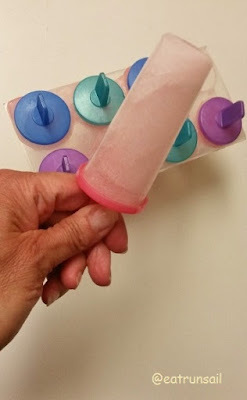 I sometimes make nuun freezie pops. And I know that some people make nuun ice-cubes too. If you are cramping up, you may be dehydrated, and you may need electrolytes or even just salt. There are also lots of recipes around for homemade electrolyte replacements as well. Find one you like and make sure to use it. And if you have a good, one, please leave a link to it or just tell me how you make it, in the comments below this post. Thanks! Since my eye surgery a few years ago, I find that my eyes are a lot more light-sensitive, even on duller days. I have several pairs of sun glasses and keep a pair stashed in my day pack too. I have a tendency to lose them and hate to have to purchase a pair on the fly. I never leave home without sun glasses. If I strain my eyes, the little blood vessels pop and I end up with bloodshot eyes for days on end. Not pretty! I also find that sun glasses help protect my eyes against wind and pollen in the air. I know that there have been some conflicting reports in recent years about the safety of various sunscreens. 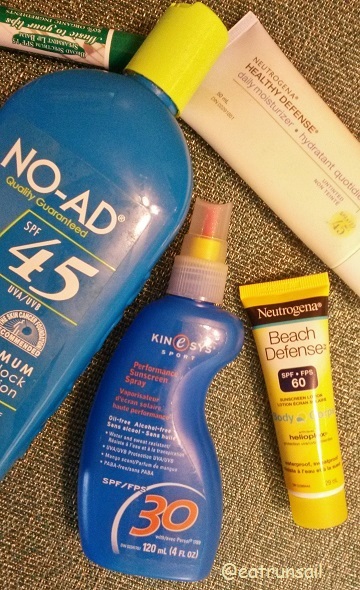 I have very fair skin and find that if I do not use a sunscreen I will burn fairly quickly. I use SPF15 on my face even in Winter. In the sunnier months, I use SPF30 for day to day wear, but if going outside for any length of time I use SPF45 or even 60. I ususally use a creamy sunscreen with SPF30 or SPF45 on my chest, upper back, arms and legs too. And I always use a balm with SPF30 or higher on my lips. If my lips get too much sun exposure I will end up with a sun blister and no one wants that! I carry a balm in my pocket and re-apply it often. I started wearing sun hats when I first began golfing many years ago because large brimmed golf hats were quite fashionable back in the day. 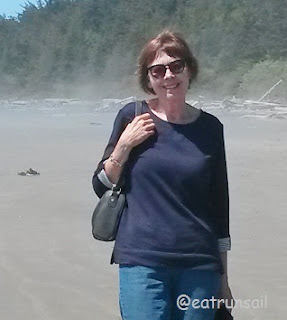 When we first moved onto the sailboat in the Summer of 2002, I began wearing a wide brimmed floppy sun hat or a cowboy hat to help keep my face from getting so tanned when out on the water. Now I have a few sun hats in my closet and do wear one when I head up to the rooftop to lounge and read. I picked up one that is made from a special fabric to take on our Hawaiian cruise a couple of years ago and find that it helps keep my hair from getting sun-damaged too. If you are running or playing sports outdoors, try to do it in the cooler parts of the day... mornings or evenings. Choose running routes and tennis courts that have some shade where possible. Frequent places you can refill your water bottle. Carry a change of socks in your pocket if you are going to be on your feet for any length of time. Clean socks feel amazing when your feet are hot and sweaty! Pay attention to your body and watch for signs of overheating... clammy hands, too fast heart beat, nausea, dizziness. Do not overdo. Take more frequent breaks. Sit down occasionally. And please do not forget about your animal friends... they need water and shade just as much as people do on hot Summer days and their paws can burn on hot pavement! Do you have any hot weather tips to share? Great tips Elle! I wish I could send you some hot/humid Chicago weather. :) Running before the sun gets too high and in the shade are key for me. Love your Nuun freezie pops! These are all really great tips! SPF + hydration is so important! I love making Nunnsicles - they are so yummy and refreshing, especially after a long run! I'm so bad about sunscreen. I know I need to do a better job protecting my skin. I was Nuun ambassador last year, but did not take advantage of the discount much.I should give the product another chance...I really don't care for the "bubbly" essence of it (though the flavors are nice). I have noticed in recent years my skin is a gritty & salty mess after a run (especially in the heat). I probably need to figure out a better hydration option than just water. Nuun pops! I love the idea and never even dawned on me to do it!! Thanks for the tips! Great tips Elle! My favorite sunscreen is made by Supergoop- I just love it! I drink a ton on Nuun year round here and the freezie pop is a great idea! For me, I have to get out early and not push it to hard if I am running anything more than 3 miles. Cheers to Summer! These are all great tips, I unfortunately live in a hot, humid climate, but I will take that over the cold any day. The socks tip is a great one, though when my feet are hot and sweaty I often just want to be barefoot, especially after I've been out running. Sunscreen is a must!!! I can't wait to make Nuun pops!